Simply pool and snooker have been trading in the snooker and pool industry since 1978. We offer a comprehensive range of pool tables, snooker tables and American pool tables including pool and snooker dining tables. All tables shown on our website have been carefully selected and from our experience, are the best within the snooker and pool industry. A bespoke service is available upon request. 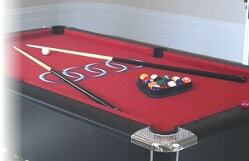 We offer a specialist pool table hire and rental service which can be for long or short term. Our professional fitters will deliver and install the tables which include all associated accessories.